At the inception of the commercial web, it was arguably a mistake that the industry went down an advertising-based route for supporting content. Some have speculated that had payments been built into the browser and the web itself, we would have substantially different online properties from search to social networking to online media. Perhaps that reality can be corrected with Bitcoin. 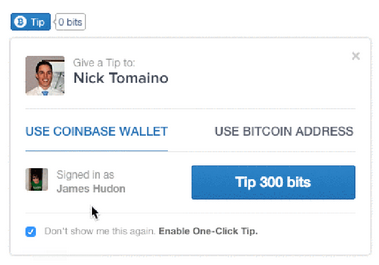 Coinbase, which is one of the biggest Bitcoin wallets in the world and is backed by Union Square Ventures and Andreessen Horowitz, is launching a micropayments feature. More than 30 percent of orders through Coinbase’s network are already $1 or below. The promise of crypto-currencies is that they can facilitate transactions with substantially lower fee structures. If you’re on the sending side, it works sort of like Facebook Connect where you’ll need to be logged into Coinbase’s network. The default tip size is 300 bits or about 10 cents, but you can customize that. Coinbase doesn’t charge a fee and doesn’t plan to for the foreseeable future. The company has a number of launch partners from Fred Wilson’s AVC blog to Beacon Reader to Dustin Curtis’ blog.